As well as journalling my way through “1001 Beers...”, I am keen to use this blog to highlight good local beers, pubs, retailers, etc, that you should give a try (see The Craic's Good, the Beers... for starters). This week I managed a lunchtime excursion to The Dirty Duck in Holywood. The Dirty Duck has a good rotation of cask and real ales available, as one gets drunk another option comes on. If you like cask and real ale its always worth calling into see what they have. During my visit they had Dirty Duck Ale (a nice session ale produced by Hilden), Kent's Best (Shepards Neame), and Volcano IPA (Barney's Beer). I only tried the Kent's Best (quick review below) this time but will be back to see their next options soon. The great thing about the Dirty Duck is that the food is as good (if not better) than the ale! 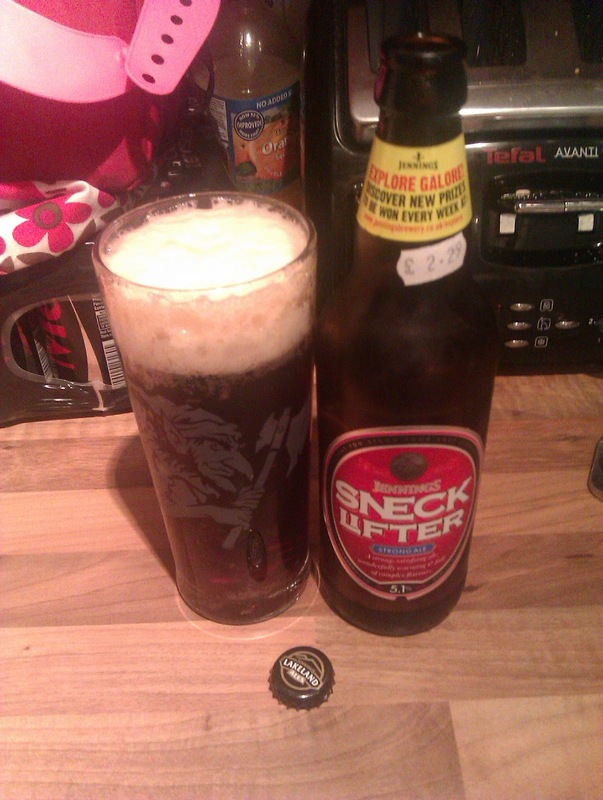 Sneck Lifter. Style: Strong Ale, ABV: 5.1%. Description: Pours dark amber. Decent head. Lots of toasted malts on the nose. Strong Coffee taste, with hints of burnt toffee and caramel. Thick mouthfeel. Conclusion: A friend of mine tried this and told me it was awful. I would disagree but I can see it might be an acquired taste. Really strong rich malts, pure coffee taste. A little sweetness, and slightly treacle like. A really nice toasted malt beer that actually tastes more alcoholic than it is. Would be perfect for a cold winters night. Kent's Best. Style: Bitter, ABV: 4.1%. Description: Amber colour, plenty of malt, and a few hops thrown in for good measure. Conclusion: Shepards Neame do some great beers – I love their double stout! I'm not a huge fan of English style bitter. This as grand, but I'd prefer something hoppier and boozier. Amacord Blonda. Style: Golden Ale, ABV: 6%. Description: Poured cloudy and light amber. Nice head with plenty of lacing that stuck about. 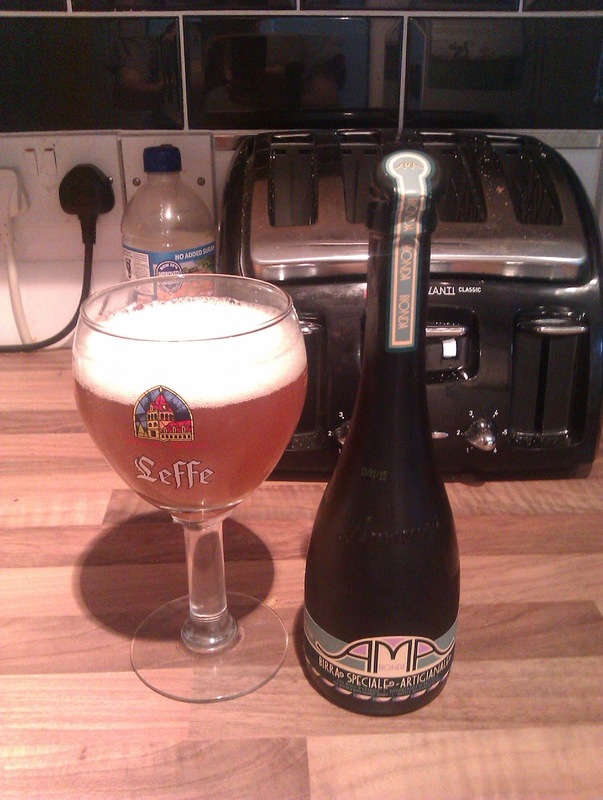 Slightly sour (bread and yeast) aroma (its bottle conditioned), with some floral tones. Sour and dry tastes, with orange twangs (the beer is flavoured with Italian Orange Blossom honey) . Mid mouth feel and decent carbonation. Brooklyn's Garret Oliver apparently helped design the beer. Conclusion: This is subtle and quite pleasant, a bit like a “light” version of a Belgian Tripel. Not quite boozy or sour enough to my taste – but that makes it a bit easier drinking and sessionable.